Los Angeles’ Bid for the 2024 Olympic and Paralympic Games Thursday celebrated the success of what organizers called an “Olympic Village Dress Rehearsal”. The bid last week helped facilitate the move-in of 12,800 University of California students into their UCLA accommodations, a process they say closely emulates that of the Olympic Village. UCLA’s Olympic gold medalists Dawn Harper-Nelson and Kyla Ross helped students with their moving effort to mark the occasion. While the use of the phrase “dress rehearsal” is somewhat overstated, it does underline the fact that one of the most typically risky and costliest venues in any Games plan is already built and in operation in Los Angeles. 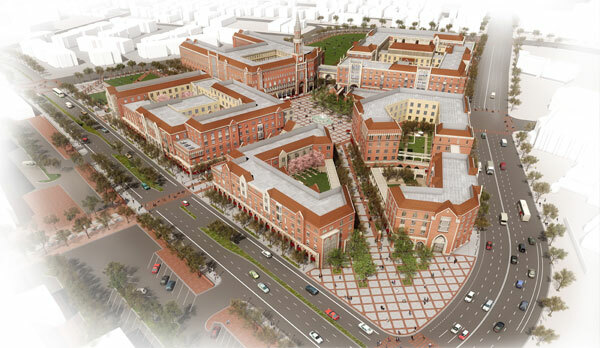 Should L.A. win its bid to host the Games in 2024 the UCLA campus will accommodate the athletes and officials in a location that is considered central in the overall Games plan and will provide easy access to four planned sports parks. 16,000 students are scheduled to reside in the facilities during the 2016/2017 school term. Eight on-campus restaurants serve up to 20,000 meals each day and will have the capacity to serve the needs of Olympians in 2024. LA 2024 is proposing a bid that leverages pre-existing facilities requiring minimal construction to deliver a low-cost, low-risk plan that could help set a new trend for the Olympic movement, steering it away from the costly, prohibitive mega-construction projects that have since made hosting the Games prohibitive for many cities. By doing away with much of the construction, the bid committee says it can instead focus on innovation and the athlete experience. The experience gained from tried-and-true processes such as last week’s UCLA move-in will also help streamline preparations for the Games increasing the odds for success. L.A. has also proposed temporary venues for some sports within its plan to help keep the footprint small and costs down. But reports out of Japan Wednesday say that the Tokyo 2020 organizing committee is planning to eliminate some of the temporary structures and instead, to reduce overall Games costs, host sports in existing facilities over three-hours away by train. The IOC will elect its host city September 13, 2017 from among L.A., Budapest and Paris. Rome, also in the race, is expected to withdraw Thursday after losing municipal government support.